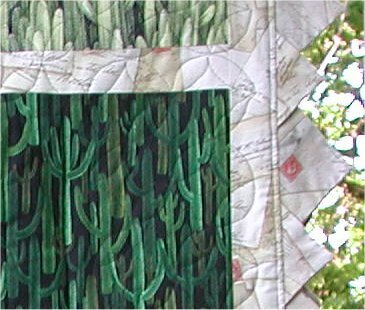 February 2004 was the second year the wonderful ladies of Arizona hosted a Quilting Retreat ... a repeat performance of the previous year's retreat. While participants were mainly quilters from the Quilting Forum, there were a few non-online quilters who were brave enough to join us .. much to everyone's delight! The 26 (or so) quilters who gathered this year was more than double the number from 2003 (12 quilters). It was delightful to reconnect with everyone from last year and meet new faces this year! One of the activities we made sure to make time for was the 1-day shop hop. Being from out-of-state, I am just amazed at the number of quality quilt stores in a fairly close area .. there must have been 5-6 stores that we hopped around to. I have a stash that could rival any decent fabric store so that I intentionally didn't leave a lot of unused space in my duffel bag when I packed for the trip. I really didn't want to be tempted to bring back MORE fabric. Really ... I didn't. Honest. Let's cut to the chase .... yes! I succumbed! :-) The prints were of nostalgic postcards and envelopes in shades of tan/ecru on a celedon green background with accents of dark rust red. Gold metallic highlight overlaid everything. I loved them both. While everyone else was scurrying around the shop, ooohhing and aaahhhing, I was standing at the end of the aisle, thinking hard, with the Michael Miller prints draped over the end. I know everyone could feel the pain waves emanating from me. :-) My challenge was how to feature these large scale prints ... cutting them up into smaller units for traditional piecing would destroy the overall look ... and I hadn't brought any patterns or yardage figures from home to work from. It occured to me that I could use them as border prints .. the smaller postcards as an inner border and the larger envelope print as the outer border. I pulled out the celedon & rust colors to use as smaller borders between the 2 prints. I was very pleased with this preliminary layout. I had a broad expanse to showcase the exquisite prints. Unfortunately, that left a large hole in the middle of the quilt. See, I was working backwards ... I wanted to focus on the border fabrics and didn't have a clue what to do for the center! In fact, the center was kind of an afterthought, but it really did need to be filled. 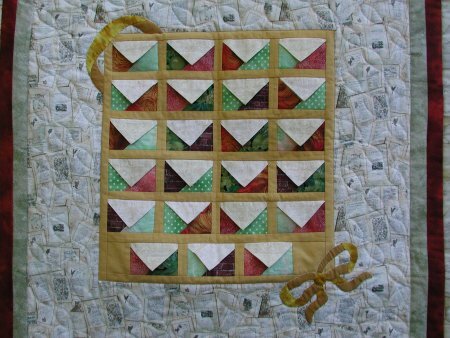 Then I thought back on one of the show-n-tell items I had brought .. the SWAK block I had done from an episode on Simply Quilts (and ended up rewriting the directions so they could be actuallly followed! 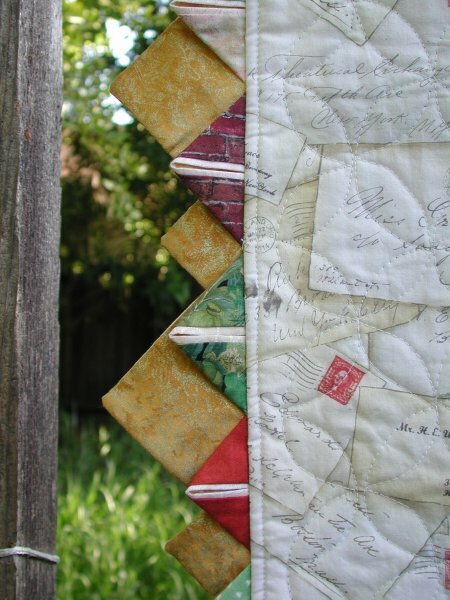 .. the improved SWAK directions are in the Informational Links section of the quilting home page). If I *really* shrunk the SWAK block, I could put a grid of them in the center. In fact, I could make them in all the different shades of the border prints .. tans, light greens, rusts .. and use gold quilter's lamé as the sashing. A backing .. every quilt needs a backing. I had no backing for this quilt. aaaaiiieeee! What to do! OH! WAIT!!! The cactus print!!! wooooo hoooo!! I used one print as the center of the back; split the other print to put on each end of the first print ... and .. and ... rats. It was too short *and* too narrow. argh. OH! WAIT!! I had leftover envelope print fabric! So, I put in strips of the envelope fabric to make the backing wider and taller .. a most excellent solution. That left the edge treatment to think about. I have been in a mindset lately of not doing the traditional, bound, straight-edge finish .. been there/done that so many times that I wanted something different. 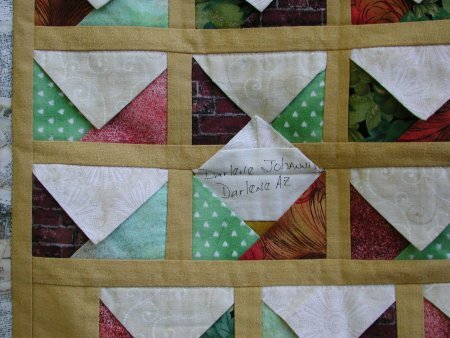 While looking at the quilt as a whole, I zeroed in on the triangular flaps of the SWAK blocks in the center. I could put praire points on the edge that would repeat those shapes! I had previously done quite a bit of research on different methods of making prairie points and decided that I'd use 2 different techniques .... a piped prairie point in the first layer and reversible prairie points in the second layer. 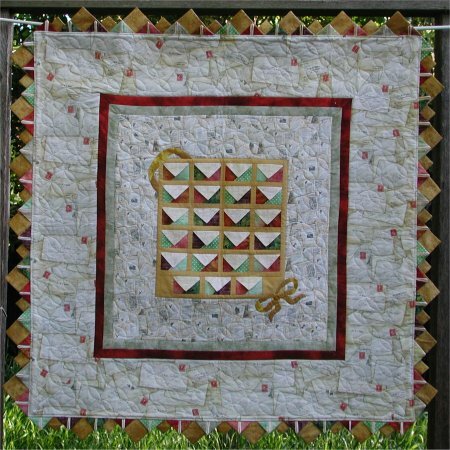 The reversible prairie points show as gold on the front of the quilt but as the envelope print on the back (to better coordinate w/ the backing fabric). Directions in PDF form on these prairie point variations can be found in the Informational Links section of the quilting home page under "Alternative Finishes". 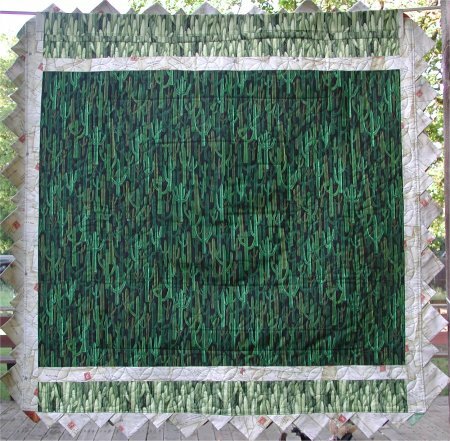 Although the front and back of the quilt were completed within 2 weeks of returning home, the prairie points and quilting took much longer due to Real Life interferrring with my fun. Stich in the ditch quilting was first done around all the SWAK blocks and borders to stablize the quilt. Orange peel quilting (intersecting circles) was done on both border prints.